App Movement is an online platform that enables communities to propose and promote ideas for mobile applications in response to community needs, collaboratively design the concept through a series of customisable features, and automate the development and deployment of a customised app. Through the design of the platform we hope to understand how communities can commission technologies and services in order to establish community driven information resources to improve everyday life of community members. 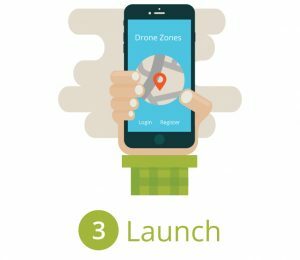 App Movement was launched in February 2015 and now has over 70,000 users who have created over 120 app campaigns and automatically generated 21 mobile applications to support communities in finding dementia friendly places, gender neutral toilets, and drone flying locations, and many more. The commissioning of technology remains firmly in the hands of those with the skills, resources, and knowledge to do so. App Movement is the first step to democratising this process and enabling anyone, anywhere to automatically generate their own mobile information resource and support their community in establishing a shared information resource in response to the issues they face. Removing the technical and monetary restrictions to developing a mobile information resource and scaffolding the process of collaborative design allows more people to engage in the creation of technologies to support communities. In order to automatically generate mobile applications the platform uses a templating approach that allows citizens to select different app templates that can be used to support their community. Currently, the platform provides two templates; a location based rating and review service (similar to TripAdvisor), and a how-to guide to share knowledge on community specific topics. The platform uses a three stage approach to scaffold the process of participation and development. These phases are the Support Phase, Design Phase, and Launch Phase. 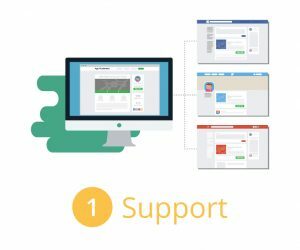 Citizens start by creating a campaign page, known as a movement, to share their idea and leverage support from their community. Similar to a Kickstarter financial target, App Movement requires citizens to gather 150 supporters within a 14-day period for the campaign to progress into the design phase. This ensures that the community are willing to engage with the idea as well as contribute and sustain the information resource when it’s launched. Once enough people have supported the idea, the supporters are invited to a design area where they can contribute their ideas and vote on other submissions from the community to select configurable options of the app such as its name, colour scheme, rating options, and logo. 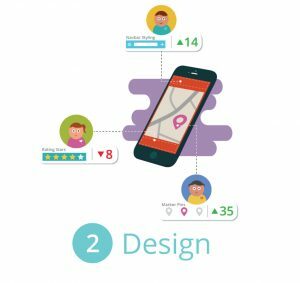 The design area also allows the community to discuss features they might like to see, or how they intend to promote the app. The design area has been developed to be simple and easy to use, in order to encourage contributions from all members within the community. After a seven-day period the design area closes and the winning contributions are selected. They are then used by the platform to automatically generate the native app for both Android and iOS. The platform will then launch the apps in the Google Play and Apple App stores and notify the supporters to begin using the app.